Home › Dating After Divorce › Should I be looking to Find Love Online or Face to Face? I got an email from a colleague about her friend who was entering the dating world after divorce about where her client should be looking to meet single men in her quest to find love. I told my friend that it’s not a one size fits all formula. Much depends on the individual when I make recommendations and I personally create an individually crafted dating plan for each client. 1. Your Personality: Are you an extrovert where you are comfortable in large groups and meet people easily? Or are you more shy, and reserved and feel more comfortable in smaller groups which are usually tied to an activity or class? 2. Your Energy Level: Are you a high energy person who is always on the go? Or are you someone who needs downtime for yourself and needs time to relax and take it easy, especially after a day’s work? 3. The Time of Year: Since it’s a numbers game, you need to consider what events and activities are where the largest number of people will be participating in the activity. For instance, from January through February is the most active time with online dating. Biking and hiking groups would be well attended during the spring, summer and early fall. 4. Your Work Situation: I take into account your work life for my clients when creating their dating plan. Are you with people all day in a very busy, hectic environment (think sales manager of a retail store) or are you working all day by yourself on a computer as a software developer? The later may not want to be on the computer on his off hours after working on it all day long on the computer. 5. Your Interests: Of course you want to meet people who share your interests. It may not be a deal breaker if your partner doesn’t like bird-watching, however, it would be an added bonus if you do share this interest with your special person. There is so much that goes into a client’s dating plan to find love. It’ is truly an art for me. What do you take into account when you are deciding where to go to meet people for dating? What has worked best for you? This curious coach would like to know. Please leave your comment below. PS. 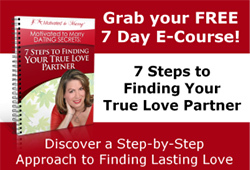 To learn more about my process with my clients to find love join my next complementary teleclass on 2/5/13 at 9 pm www.MotivatedtoMarryfreeteleclass.com. I will be giving my Dating Plan Template away as my SPECIAL GIFT for attending the call. If you can’t make it, sign up anyway so you can get access to the audio recording and get your gift!